The decanter centrifuge has a wide uses depending on different applications , it can be used for de – water hydrocyclone under flow , remove the drilling solids from active drilling mud , or revove colloidal solids particals in weighted drilling mud . 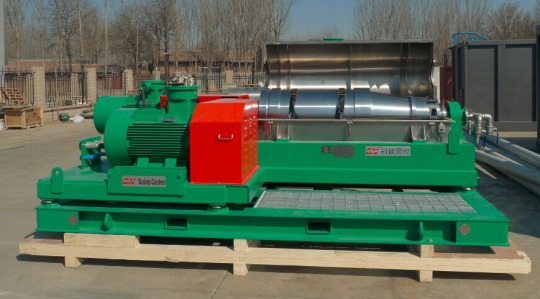 The centrifuge can be used for unweighted drilling mud , while mud recycling again and again , the drilling mud will get heavier and heavier , then the heavier mud will be no good to reuse again . There are different design of decanter centrifuge , according to separation size , there will be designed profor G force to reach separation point . G Force is a very important parameter for centrifuge application , while the G force get higher , the separation factor will get higher but will need higher standard to keep sure centrifuge screw and bowl to be suiltable of the G force . For a same decanter centrifuge , the higher G force will increase mud flow treatment capacity also . However , the increasing G force eventually reduces solids conveyance capacity due to torque limitation . As the g force increase , more and solids will be settled in the bowl bottom of inside , then solids will be more tightly and more conveyor or torque will be required to remove the solids out of bowl . The solids dryness from decanter centrifuge can be adjustable by adjust fluids outlet height plate . The dryness is commonly considered as a direct indication of a centrifuge performance , but the test results has shown that the dryness of solids from centrifuge is more correctly as a fuction of partical size . The pond depth will control both fluids residence and cake dryness .If you increased pond depth , the residence time will increase separation and separation performance will be better . Any how this will be depending on the drilling condition and fix a suitable depth .